Here we are in the penultimate issue of the Damage series and what a long strange journey it has been. The series lingered from issue to issue forever simply featuring different guest stars and not doing much of anything at all really. However, these last few issues, right at the end of the series, have actually told more of an interesting and original story than at any other point. It almost makes one wonder "what could have been" ... almost, but not quite. 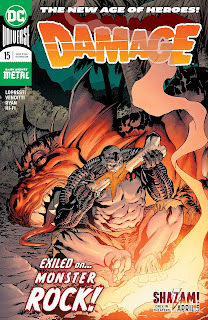 So let's jump in here and discuss the second to last issue of Damage. The issue begins with Ethan running through the jungle away from a group of monsters. Congo Bill eventually comes to his aid, calling the beasts off with his ring powers, explaining to Ethan that he will have to learn how to deal with some of his problems as Ethan, not always letting Damage do the dirty work. All in all, it makes Congo Bill come off as a better character than he initially did the previous issue, while giving the character of Ethan/Damage a different challenge for once, besides just punching things. 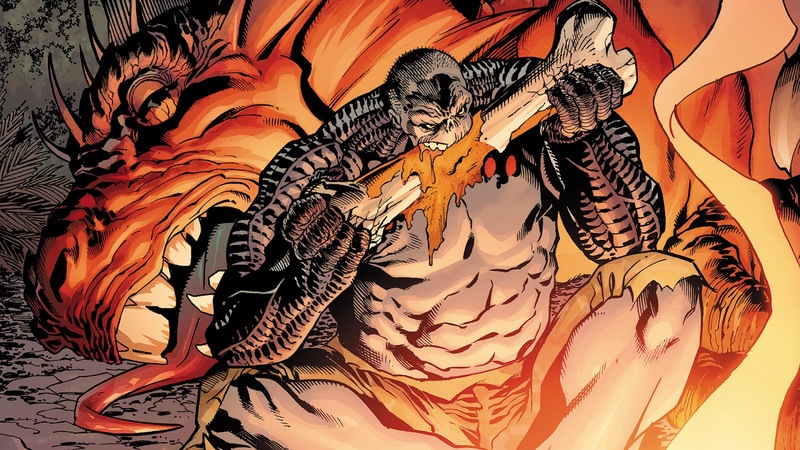 As the issue progresses, we see a new threat emerge on Monster Island and 'she' means business, quickly gaining control of the monsters that were chasing Ethan, and combining them into one Super Monster to be dealt with later. The remainder of the issue involves Congo Bill and Ethan with a little back and forth between each other before Ethan eventually submits and agrees to be 'trained' by Congo Bill to help control his little 'anger condition'. It all rather moves quickly as forced setup, but at this point, we have to with only one issue left in the pipeline, so I'm genuinely ok with it here because again at least its something different for once, and not just Ethan repeating the same mantra. As the page count begins to wind down Ethan decides to take the advice that Congo Bill has been dishing out to heart just at the worst possible time. Ethan and Bill conclude the issue being knocked out by the Super Monster created earlier in the issue with our threat revealed to be Echidna, the Mother of Monsters, claiming Monster Rock as her own. This all sets up what should be a pretty interesting conclusion to the Damage series after a very rocky start, allowing the character up to be used in the future, if at all necessary. The art as always looks excellent as Lopresti and company do a great job bringing the different monsters to life in these issue on Monster Rock. If there has been one constant throughout this run its that the art has never been the series problem. 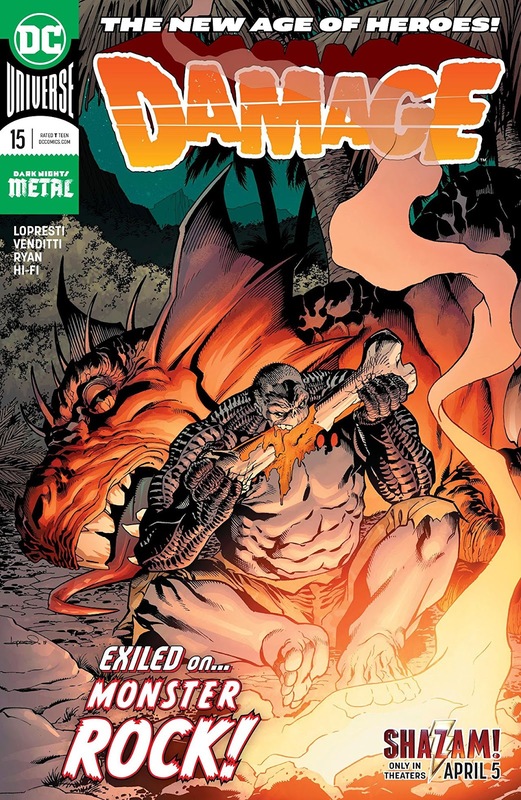 As a whole, this issue of Damage seems to have found a bit of footing, it's just a bit too late in the lifespan of this series for anyone to really bother at this point. If Damage was able to get to Monster Rock earlier in its run, to give this book more of a purpose moving forward, it would have been very good for the characterization of Ethan. At the least, you can anticipate a solid original send-off for Ethan/Damage, which is something I wouldn't have said before this final arc began.